Osteopathic medicine is a science-based discipline with a strong philosophical grounding that focuses on the whole person. It follows the French and Italian model of medical education, emphasizing examination and understanding of the people being cared for. This is in contrast to MD-granting (allopathic) medical schools, which are rooted in the German model of education, emphasizing laboratory-based evaluation of patients. Nevertheless, osteopathic medical school curricula is very similar to those used at U.S. allopathic medical schools, although the exact program varies by college. Osteopathic medical school accreditation standards require training in internal medicine, obstetrics/gynecology, pediatrics, family practice, surgery, psychiatry, radiology, preventive medicine, and public health. Osteopathic medical schools emphasize early clinical contact. 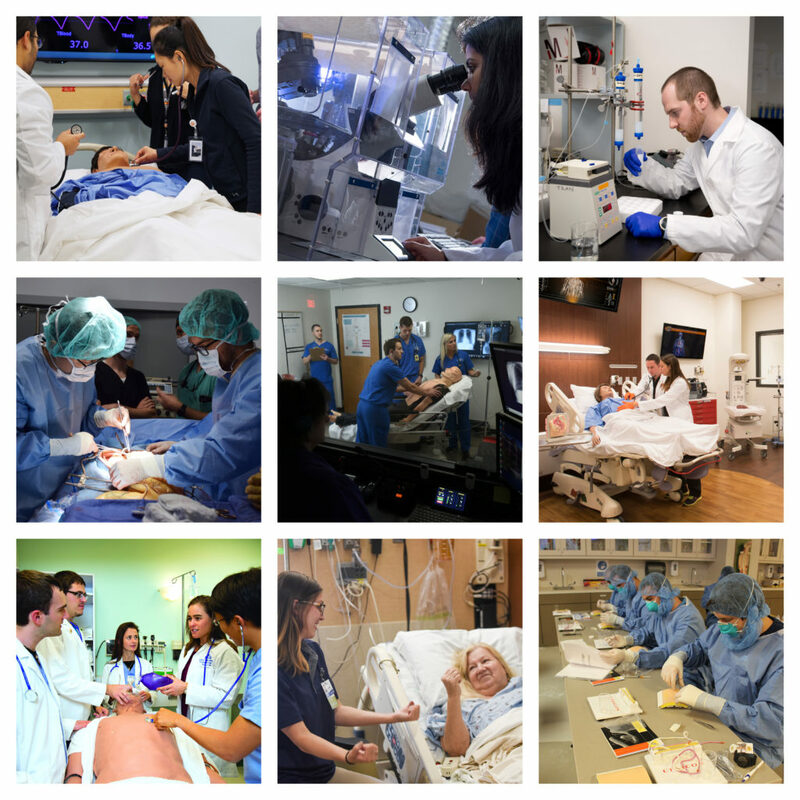 While the first two years focus on the biomedical and clinical sciences, the second two years delve deeper into patient-oriented clinical training. Most schools include time for elective courses as well. DO clinical education follows a distributive model, wherein students are exposed to practicing in diverse health care settings. Although in-hospital experiences are an important aspect of clinical education, osteopathic medical students receive significant training in community hospitals as well as out-of-hospital ambulatory settings. In many schools, a community-based primary care rotation in a rural or underserved area is a required aspect of fourth-year training. For information on each school’s curriculum, see the individual college pages. Although osteopathic medical education has changed dramatically since its beginnings in 1874, osteopathic medical schools maintain the core values advanced by the profession’s early proponents. These values are held as central distinguishing tenets of osteopathic philosophy and practice: providing care that is holistic, patient-centered, preventive, and focused on health rather than disease, delivered within a primary care context. The osteopathic medical school curriculum is perhaps most distinguished by the inclusion of osteopathic manipulative medicine (OMM), a hands-on treatment that is used to diagnose and treat people in a primary or adjunctive way, enhancing overall health and the holistic functioning of the human body. OMM education usually occurs through year-long first- and second-year theoretical and skills courses and through subsequent clinical experiences. OMM education is in addition to, and integrated with, medical training on current and emerging theories and methods of medical diagnosis and treatment. For more information on osteopathic medicine, see the overview. Osteopathic medical schools are accredited by the American Osteopathic Association Commission on Osteopathic College Accreditation (COCA), recognized to accredit osteopathic medical education by the U.S. Department of Education. Learn more here. Many osteopathic medical schools are also accredited by a regional educational accrediting organization. New colleges of osteopathic medicine (COMs) hold provisional accreditation status during their first four years of student enrollment. A college holding provisional accreditation status may admit students and offer medical instruction. During the year preceding the graduation of its first class, a provisionally accredited COM will conduct various activities that will allow it to attain fully-accredited status New term will be pre-accrediation, there will no longer be provisional accreditation. Each osteopathic medical school has its own curriculum. Some are discipline-based, focusing on each science separately. Others allow students to learn through patient-based, or problem-based, learning. Many use a mix of methods. Osteopathic medical school starts with a foundation in the basic sciences of medicine. In addition, students learn a core set of clinical examination skills and gain an understanding of the various systems of the body. Lectures, laboratories, and other learning experiences are designed to prepare students for the clinical portion of medical school—the clinical clerkship years.